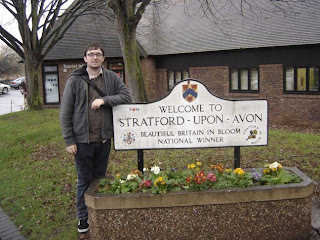 Alex and I rolled on down to Great Portland Street Station and hopped on a bus to go to Stratford-Upon-Avon. If you are not familiar Stratford, it is where William Shakespeare was born, lived and died. We took the trip with a bunch of people we didn't know through an organization called International Friends, which specializes in day and weekend trips for overseas visitors to London and the surrounding areas. We toured Anne Hathaway's house outside of Stratford first. Anne Hathaway was Shakespeare's wife. The small house, which has the same slate floor as it did in the 1500s when it was built, housed more than 15 generations of Hathaway's until the early 1900s when it became an exhibit and was refurbished. The tour guide not only gave us a tour of the house, she proceeded to explain the originals of such phrases, that the English speaking world use. Such as: Threshold, Board Table, and more. We left the Hathaway house after about an hour and headed into Stratford. Along the way signs of the bus driver's, shall we say, inefficiencies, began to arise. Driving down the very windy and small lane, the driver almost side-swiped a defenseless Honda. But, before long we were in Stratford and thoughts of his driving fleeted, as the rain came pouring down. Soon after getting off the bus, I headed to see Shakespeare's birthplace which was situated at the center of town. I decided to just take pictures outside of the house, which looked a lot like the rest of the town, but had been kept up and allocated a spot in the center of town. I decided not to go in because it was another 10 pounds that I didn't need to spend. However, if Shakespeare manger or whatever that he laid in with the original blanket was in there i might have reconsidered, but it wasn't, so i moved on. After snap, snap, snap, I headed for the edge of town, which the tour guide said was quite a walk. Obviously she's never been to London, or Ball State for that matter. It was a mere 10 minute walk to the Holy Trinity Church. 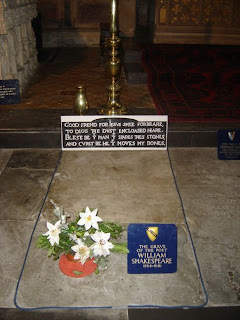 Once there, as the rain came pouring down, not allowing me to use my video camera, we hurried into the church, paid the priest, situated half way up to the pulpit and walked in to see the final resting place of one, William Shakespeare. It was kind of moving walking into the indoor tomb area that was roped off just for decendents of Shakespeare. I wish you could have seen it. I have never been a huge Shakespeare buff, but have read 5 or so of his plays and was purely moved in seeing his grave that has set the same way for nearly 400 years. After viewing the grave we walked back to town and mingled through the old parts and the new parts. However, i was quite dissapointed to see the amount of commercialism that had set itself upon this small town. I was sickened that rather than old stores and shops set up along the street ruled, it was made up of H & M, Subway, Pizza Hut, Mark's and Spencer and other commercial enterprises. But, I'm glad we went and it was all worth the trip to see Shakespeare's grave and where he lived. On the way home we got to watch, in entirety Shakespeare In Love, which I had never seen all the way through. Although, it depicted a view of Shakespeare that I'm sure was not exactly true. However, driving home, the bus driver, obviously a bit taken from a few hours at the the pub, began to drive erratically, again. He swerved around cars to pass and drove in such a manner I have not seen since the last time, well, I was driving. About 25 minutes outside of Stratford, we were driving past an Aldi's, who would have thought? And, I don't know if he was as stunned as I was to see this American institution in the UK, but swerved over a curb nearly took out another Honda, hit his breaks. . . then, heard a thud and down on the floor over the newly stopped bus lay the bus driver. He had fallen out of his seat down the stairs on the opposite side, but quickly hopped up and took off again, like nothing. At first I had not one idea, of what had happened, and continued watching the movie. It wasn't until we were walking back and I was telling Alex about it, that I reallized what had happened. Hilarious is a word for it, but strange might be even better. I like your costume, harry. I heard that the English like covering their heads with bedsheets to better enjoy their chronic foot odor and cabbage farts. Is that true?